Humans probably domesticated wolves before any other species. Dogs and hounds have been workmates for guarding, herding, pulling and finding by scent. They are also companions and reminders of nature in urban societies. Their hunting instincts are esteemed in recreation, and for conservation research on elusive animals, such as finding game-bird chicks. They also need exercise, and thus like horse-riding can be a reason for preserving semi-natural routes that also benefit wild flora and fauna. Naturalliance sees owners of dogs as people who need to repay nature for the joy it brings them and their canine companions. We look forward to reporting the innovations that you can develop to benefit dogs, hounds, wildlife and society as a whole. BEST PRACTICE. Partridges, dogs and hawks in Italy – or use of dogs guarding livestock to reduce pressure on wolves. PRODUCTION. 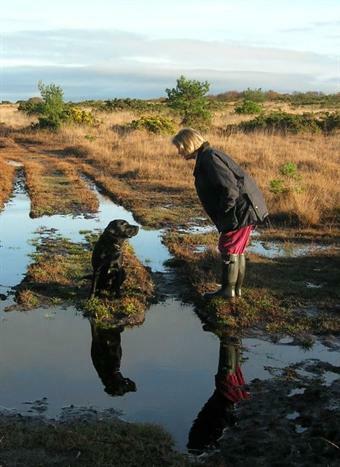 How owners of dogs and hounds can organise for greater benefit to nature. PROBLEM-SOLVING. Can your dog-training skills help those whose dogs are less socialised? Disturbance by dogs may be unwelcome for wildlife in some areas, but could dogs be encouraged elsewhere in order to deter problem species? MAPPING is the key to developing and maintaining routes that are good for exercising dogs while also encouraging habitats that benefit wild species. • Encourage understanding of dogs and hounds as an introduction to understanding nature. When you register, you can complete our SURVEY to tell us what information you would most like.